On December 30, 2015, the International Union of Pure and Applied Chemistry announced the discovery of four new chemical elements—numbers 113, 115, 117, and 118—the first new elements added to the periodic table since 2011. For the time being, they have the fairly clunky Latin and Greek numerical names ununtium (Uut), ununpentium (Uup), ununseptium (Uus), and ununoctium (Uuo), but, by IUPAC rules, their discovers now get the chance to officially name them. Online, there’s growing support to name one of these new “heavy metal” elements lemmium in honor of Motörhead frontman Lemmy (who died two days before they were announced), and another octarine after the fictional “color of magic” in the late Sir Terry Pratchett’s Discworld novels (Pratchett died in March 2015). Whether these two petitions will come to fruition remains to be seen—the final names are not likely to be announced until later in the spring—but as IUPAC rules demand all new elements be named after either a mythological concept or character, a mineral, a place, a property of the element itself, or a scientist [PDF], it seems unlikely we’ll be seeing lemmium on the walls of chemistry classes any time soon. The stories behind 20 other chemical element names are explained here. Despite being the least dense metal, lithium takes its name from the Greek word for “stone,” lithos, because it was discovered in a rock (as opposed to the other alkali metals potassium and sodium, which were discovered in plants and animals). The name carbon comes from the Latin word carbo, meaning “coal” or “charcoal.” A small carbo, incidentally, was a carbunculus, which is the origin of carbuncle. Neon takes its name from neos, the Greek word for “new” (it was “newly” discovered in 1898). Phosphorus literally means “light-bearer” or “light-bringing,” as the first compound of the element glowed in the dark. A century before it became the name of element 15 in the late 1600s, Phosphorus was an alternative name for the planet Venus, whose appearance in the sky was once believed to strengthen the light and heat of the Sun. One of the transition metals, pure vanadium is a harsh steel-grey color, but four of its oxidation states produce a rainbow of solutions, colored purple, green, blue, and yellow. Because he was so impressed with how beautiful and varied these solutions were, the Swedish chemist Nils Sefström chose to name vanadium after Vanadís, an alternate name for the Norse goddess of beauty, Freya. Vanadium’s next door neighbor, chromium (24), also produces a variety of colored compounds and so takes its name from the Greek word for “color,” chroma. Cobalt is often naturally found alongside or in minerals combined with arsenic, and when smelted, cobalt ore can emit noxious arsenic-laden fumes. Long before the poisonous qualities of minerals like these could be explained by science, copper miners in central Europe had no better explanation than to presume these toxic effects were supernatural, and were caused by devious underground goblins called kobolds who lived inside the rock—and it's from the German word kobold that cobalt gets its name. The chemical symbol for copper is Cu, which derives from the metal’s Latin name, cuprum. In turn, cuprum is descended from Kyprios, the Ancient Greek name for the island of Cyprus, which was well known in antiquity for its production of copper. 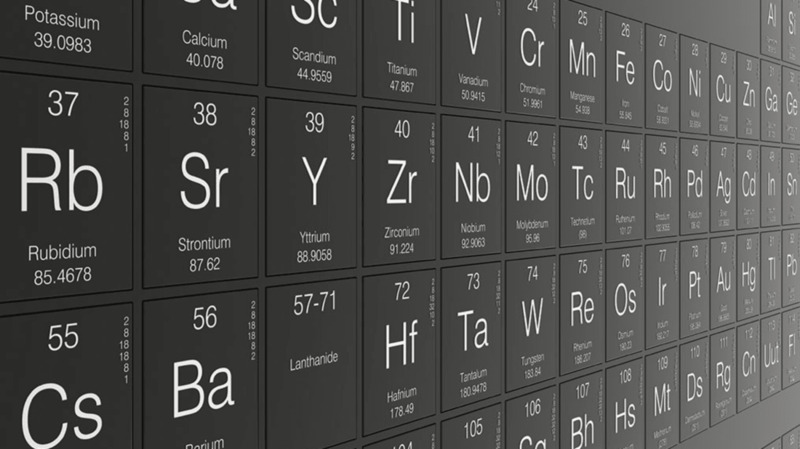 Some other chemical elements named after places include germanium (32), americium (95), berkelium (97), californium (98), and darmstadtium (110), while the elements ruthenium (44), holmium (67), lutetium (71), hafnium (72), and polonium (84) take their names from the Latin names for Russia (Ruthenia), Stockholm (Holmia), Paris (Lutetia), Copenhagen (Hafnia), and Poland (Polonia). A brittle, silvery-colored metal with a melting point just above room temperature, at 85ºF—meaning that a solid block would quite easily melt in your hand—gallium was discovered in 1875 by the French chemist Paul-Émile Lecoq de Boisbaudran. He chose to name it after Gaul, the Latin name for France, but soon after his discovery was announced, de Boisbaudran was forced to deny allegations that he had actually intended the name gallium to be a self-referencing pun on his own name: Lecoq means “the rooster” in French, while the Latin word for “rooster” is gallus. Despite explicitly writing in a paper in 1877 that France was the true namesake, the rumor dogged de Boisbaudran his whole life and has endured to today. Because it is colorless, odorless, and so difficult to discover, krypton takes its name from the Greek word for “hidden,” kryptos. The only chemical element named after a place in Britain, strontium takes its name from its mineral ore strontianite, which was in turn named after the town of Strontian in the Scottish Highlands near where it was discovered in 1790. In 1787, a Swedish Army officer and part-time chemist named Carl Axel Arrhenius came across an unusually heavy, black-colored rock in the waste heap of a quarry near the village of Ytterby, 15 miles outside Stockholm. He named his discovery ytterbite, and sent a sample of the mineral to his colleague, Professor Johan Gadolin (the namesake of element number 64, gadolinium), at Åbo University in modern-day Finland. Gadolin found that it contained an element that was entirely new to science, which he called yttrium; since then, many more elements have been discovered in Ytterby’s mine, and three more—terbium (65), erbium (68), ytterbium (70)—have been given names honoring the village in which it was discovered. Consequently, the tiny Swedish village of Ytterby remains the most-honored location on the entire periodic table. To etymologists, antimony is probably the most troublesome of all chemical element names, and its true origin remains a mystery. Instead, various unproven theories claim that it might derive from Greek words meaning “floret” (a reference to the spiky appearance of its ore, stibnite), “against solitude” (a reference to the idea that it never appears naturally in its pure form), and even “monk-killer” (as antimony is poisonous, and many early alchemists were monks). Because of the greenish color of its mineral salts, the lanthanide metal praseodymium takes its name from a Greek word meaning “green,” prasios—which in turn takes its name from the Greek word for a leek, prason. The dymium part is more complicated. In 1842, a new “element” was discovered called didymium, from the Greek for "twin," so named because it was always accompanied with cerium and lanthanum (and possibly because the namer had two pairs of twins of his own). Forty years later, scientists split didymium into two different elements, praseodidymium (green twin) and neodidymium (new twin). The di- was dropped almost instantly, leaving neodymium and praseodymium. Several famous names are commemorated on the periodic table, including Albert Einstein (einsteinium, 99), Niels Bohr (bohrium, 107), Enrico Fermi (fermium, 100), Alfred Nobel (nobelium, 102), and Pierre and Marie Curie (curium, 96). The earliest eponymous element, however, was the little-known metal samarium, which indirectly took its name from an equally little-known Russian mining engineer called Vasili Samarsky-Bykhovets. In the early 1800s, Samarsky was working as chief clerk of the Russian mining department when he granted a German mineralogist named Gustav Rose access to a collection of samples taken from a mine in the Ural Mountains. Rose discovered a new mineral in one of the samples, which he named samarskite in Samarsky’s honor; decades later, in 1879, de Boisbaudran found that samarskite contained an element that was new to science, which in turn he named samarium. Ten times rarer than gold in the universe, tantalum is a hard, silvery metal known for its resistance to corrosion and its chemical inertness, both of which make it extremely useful in the manufacture of laboratory equipment and medical implants. Although it’s sometimes said to have been named for the “tantalizing” frustration early chemists experienced in trying to obtain a pure sample, it’s tantalum’s unreactiveness that is the real origin of its name: Because it appears unaffected by practically anything it is submerged in or brought into contact with, tantalum is named for Tantalus, a character in Greek mythology who was punished by being forced to stand knee-deep in a pool of water below a fruit tree, both of which drew away from him whenever he reached out to eat or drink (a story which is also the origin of the word tantalize). Incidentally, Tantalus’s daughter Niobe also features on the periodic table as the namesake of element 41, niobium. Uranium was discovered by the German chemist Martin Heinrich Klaproth in 1789, who named it honor of the planet Uranus, which had also only recently been discovered. When elements 93 and 94 were discovered in 1940, they were named neptunium and plutonium so as to continue the sequence of planets. The invention of the periodic table is credited to the Russian chemist Dmitri Mendeleev in 1869, whose organization of the table allowed him not only to predict the existence of elements that had yet to be discovered at the time, but to correct what was generally understood about the properties of some existing elements. Element number 101, mendelevium, is appropriately named in his honor.